Using the garage door is part of the daily routine of most homeowners, so when the system suddenly refused to work, it can be terribly inconvenient, to say the least. Like any electromechanical device, over time, wear and tear will take its toll on the opener (which is the motor unit that automates the door's operation) and problems can be expected to arise. Find out what the most common problems are and what you can do about them. There are a number of potential causes for a door not opening or closing completely, the most common one is that safety sensors have gotten out of alignment and will need to be repositioned. Other potential reasons involve broken rollers or bent tracks. If the door experiences resistance while trying to close, the opener's auto-reverse mechanism could be engaged, mistaking the residence for an obstacle. Any of these reasons will easily be identified by a professional (like one of our technicians) who will be able to repair or replace the malfunctioning parts on the spot using proper tools. Another frustrating situation is when you press the remote control and the door does not budge at all. One of the common reasons for this is a problem with the circuit board of the opener, sometimes called the logic board. In this case, a wire might need to be replaced, or the entire board even, depending on the extent of the damage. Also, sometimes the remote control itself needs to be reprogrammed, or repaired. In any case, unless you have the technical skills to open the motor unit and safely replace wires, it is strongly recommended to bring in a professional. The springs, which provide the counterbalance for the weight of the door, are some of the most important parts of the entire mechanism. Without them, lifting the door will be just about impossible. The opener is the device that initiates the opening or closing action, but the springs and cables are the ones that support the panels' weight. When they break, opening the door will simply not be possible. Even broken cables will give you a lot of trouble, and while the door may be able to move, it will put a lot of extra strain on all the other parts, which will be incredibly dangerous. Early detection and prevention will save you the hassle of dealing with most of the abovementioned problems. 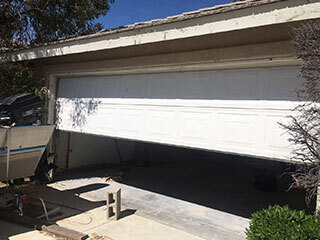 Our team at Garage Door Repair Hastings offers regular maintenance appointments during which we perform thorough inspections that help us nip such issues in the bud. Of course, if you find yourself dealing any type of problem, our emergency repair specialists are at your service.